It's a central tenet of evolution: Life must adapt to its surroundings or die. And the genome knows it. A new study published in the journal Nature shows that in more stressful surroundings, a yeast cell's genome actually gains or loses chromosomes, improving the cell's ability to mutate - and thus its adaptability. This mechanism could explain how some cancerous cells manage to survive the poisonous onslaught of chemotherapy. Scientists from the Stowers Institute for Medical Research exposed yeast to stress-inducing chemicals, and then examined their chromosomes. When a yeast cell reproduces under normal conditions, cellular mechanisms kick in to make sure that chromosomes are transmitted carefully to the daughter cells. Under stressful conditions, however, these mechanisms broke down, with daughter cells sometimes losing a chromosome or gaining a superfluous one, and passing this abnormal genome down to their own descendents. But how can a cell thrive when it's missing whole chromosomes? After all, chromosomal instability, also known as aneuploidy, is most frequently encountered in cases of cancer, developmental defects, and poor cellular health. But yeast may be the exception to the rule, with abnormal numbers of chromosomes found in both the yeast in your kitchen and the wild strains outside. An earlier study had found that the yeast with an odd number of chromosomes could actually survive stressful conditions better than their normal counterparts. Creative mutations occur more readily in the abnormal cells, allowing them to evolve and adapt to the dangers of their environment more quickly. Based on these earlier results, the researchers decided to see if the stress itself was inducing the chromosomal instability that allowed yeast to resist the stressors. Exposure to a variety of yeast-harming chemicals provided stressful environments for the yeast, which responded by losing and gaining chromosomes at ten to twenty times the usual rate of chromosome loss. And specific chromosomes led to protection from specific drugs. For example, yeast exposed to fluconazole, a drug used to eradicate yeast infections and meningitis, usually evolved into resistant colonies with an extra chromosome VIII, while those colonies that evolved to resist the fungicide benomyl tended to have no chromosome XII. Interestingly, it didn't take much stress to cause aneuploidy. The yeast were exposed to protein-inhibiting radicicol at a very low concentration, so low that it barely slowed cellular growth - but it was still enough to create chromosome instability, which allowed radicicol-resistant yeast colonies to evolve. This resistance came in handy in more than one environment: When exposed to other anti-yeast drugs, the radicicol-resistant yeast could still survive more successfully than yeast cells that started out with a normal complement of chromosomes. Aneuploidy may help the yeast survive stress, but it's not an ideal condition. Researchers took yeast that had lost chromosome XVI when exposed to tunicamycin, an enzyme inhibitor, and grew it in a drug-free environment. Without the stress of the chemical, the yeast developed into two separate colonies: one with cells that had lost a chromosome XVI and one whose cells had regained the chromosome to revert to a normal yeast genome. The colony that had regained the chromosome grew faster than its chromosome-missing counterpart. It had, however, lost its resistance to tunicamycin. For yeast cells in a healthy environment, cells with a normal, stable number of chromosomes are more fit than those with aneuploidy. 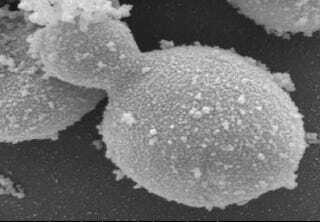 But under stressful conditions, the aneuploidy helps yeast outlive its normal counterpart. Plus, the fact that losing chromosome XVI led to tunicamycin resistance, while reverting to the normal number of chromosomes came at the cost of the drug resistance, indicates that the aneuploidy was directly linked to the drug resistance. As the researchers write, "These findings demonstrate that aneuploidy is a form of stress-inducible mutation in eukaryotes, capable of fuelling rapid phenotypic evolution and drug resistance." If stress itself causes the chromosomal instability that lets cells adapt to the stressful chemical, this could explain how cancer resists chemotherapy treatment. The toxins in chemotherapy can kill cancer cells, the way that a fungicide can kill yeast cells, but if the chemo drugs also trigger the cancer cells to lose or gain chromosomes, the tumor may be able to adapt to the stressful environment and survive the chemotherapy. To avoid this situation and make cancer treatments more effective, further research should explore the link between stressful environments and faster adaptation.